Uh-huh uh huh, yeah, another new Webisode! Its all about the food. YouTube has some technical dysfunctions, so I uploaded the video on Daily Motion. Today we celebrate Malaysia’s 50th year of independence! Its been 50 years since Malaysia was released from the British occupation in 1957. 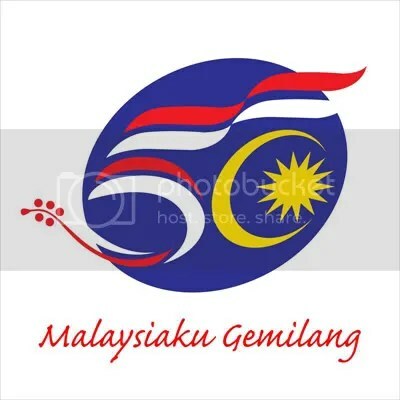 I’m glad they changed the theme for this year, ‘Malaysia Gemilang’, which means Outstanding Malaysia. The past few years have always been ‘KeranaMu Malaysia’, which means Because Of You, Malaysia. The ‘Keranamu Malaysia’ song is still sung, and I’m not surprised if a new one titled ‘Malaysia Gemilang’ comes out soon. That pic up there is one of the most seen pictures in Malaysia history. It features our first Prime Minister, Tunku Abdul Rahman shouting ‘Merdeka’ (Independance) for 7 times at the Merdeka Stadium. Today at the celebration, Prince Andrew came to see the show. I’m sure he was quite bored…? Hehe. The king and queen looked very entertained though. Ironically, today’s the day Princess Diana died 10 years ago in the infamous car crash. But thats by-the-by now. Hope this year will bring more prosperity! Happy birthday Malaysia! And Selamat Hari Kemerdekaan to all Malaysians! People beware… A new virus hitting the town. The newspapers are also featuring this. If you get an email from a so called ‘YouTube’ sender and got nothing to do with it or you think its spam, delete it immediately. It’s so scary nowadays. I hate spam. In fact, I got 3 of them in my mail. Freaky scary. Screencap of what I got. Firstly, I’m already a member of YouTube, so why should I sign up? Collect $500? Yeah right. Other two are about a video and ‘How To be Rich and Wealthy’? As if a video can teach me that. I deleted them immediately. Thankfully. In fact, if you open it and follow the link, the virus will be planted in your PC and you’ll be a zombie and sending spam mail to all your contacts. You dont want that to happen. You are currently browsing the - My Domain Of Craziness - blog archives for the day Friday, August 31st, 2007.